50th Weeting Steam Rally was a roaring success in the summer heat! - 50th Weeting Steam Rally was a roaring success in the summer heat! Home > Back > 50th Weeting Steam Rally was a roaring success in the summer heat! 50th Weeting Steam Rally was a roaring success in the summer heat! 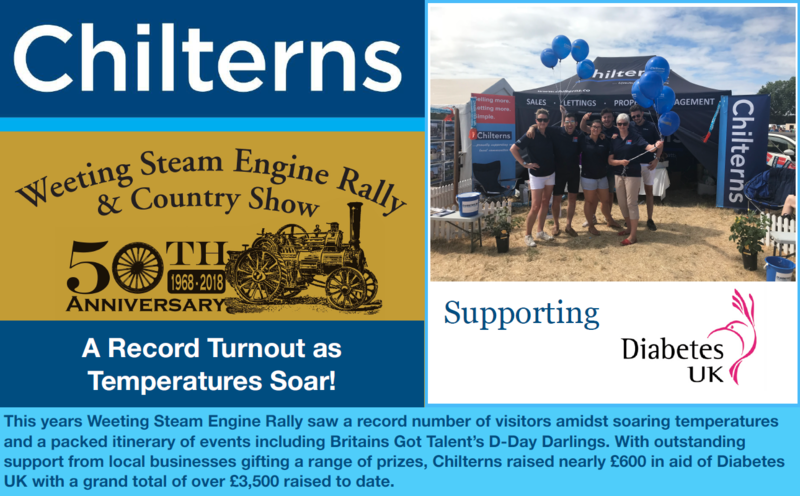 Being part of the Weeting Steam Engine Rally year on year has become as much a part of Chilterns as selling or letting houses. We do it because we love it. What we really love about the rally, apart from the wonderful comradery of all those involved is the many thousands of people that come along and throw themselves into the spirit of the event. It’s the purity of community in its best possible form and it is this community energy that shines through and makes the rally such an outstanding event. Chilterns role is quite simple, we just want to be part of it, to interact with the community and to see old friends and new - it’s a festival after all. It is also an opportunity to give something back to the community and as we support Diabetes UK amongst other charities, we hold an annual raffle with all prizes donated by the local business community. This year we raised nearly £600, bringing the total raised so far to approximately £3,500. We really did have some great prizes this year and we would like to offer our thanks to all those businesses that made such generous donations. ....and of course we mustn’t forget that it was a hot one this year but that didn’t stop the record breaking attendance on what was the rally’s 50th Anniversary. Special mention for Wendy Young of the Weeting Rally who works so tirelessly year on year to make it the success it is.